While texting and driving is a well-established safety and legal faux pas, A New Jersey town escalated the texting ban to other modes of transportation, such as walking. Fort Lee, New Jersey made texting while walking illegal for its 35,000 residents - that is if their texting is deemed to be dangerous to others around them. Police who catch pedestrians that text while jaywalking and causing a danger to others will get an $85 fine. It sounds rather silly at first, but Fort Lee police chief Thomas Ripoli is taking the matter very seriously. Deathly serious, in fact, as the town suffered three fatal pedestrian texting accidents so far this year. "It's a big distraction," Ripoli told ABC News. "Pedestrians aren't watching where they are going and they are not aware." During a grace period in March police officers handed out informational pamphlets about the dangers of simultaneous walking and texting to raise awareness of the law. Since then more 117 tickets have been dished out. A report last year by the Pew Internet and American Life Project found that 73 percent of adult cell phone owners age 30 and over send and receive an average of 41.5 text messages each day. That number rises for young adults ages 18-29, with 93 percent averaging 87.7 texts every day. 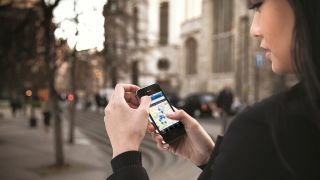 With people increasingly living on the go, it isn't a stretch to guess that a fair number of those daily texts happen while walking from place to place. And for New Jersey residents, that busy lifestyle could earn you a nice ticket for your trouble.